Hi Friends: Today I'm showing my 2nd card for the release of the new Yorkshire Terrier stamp set from JessicaLynnOriginal stamps. I really love this set - the stamps are so cute and easy to work with. For full details of how to create this card, see my instructions and supplies listed below. Thanks for joining me for a second look at the release of this great new stamp set! Have a great, creative day! Stamp focal image onto smooth white cardstock using Memento Tuxedo Black ink and color with Spectrum Noir markers. Add some glitter brush pen to the sweater and some Glossy Accents on the eyes and nose. Die-cut image using stitched oval die. Using the Gypsy papers, cut background paper to fit A2 card base, emboss with floral embossing folder, then enhance the raised portions with silver Inka Gold. Ink edges and glue to card base. Cut 3 additional coordinating ovals from the card pack - use the next 2 larger stitched oval and the eyelet oval dies and ink edges. Glue eyelet oval directly to card base. Frame the focal image with the next 2 larger ovals, then add to card with foam squares. 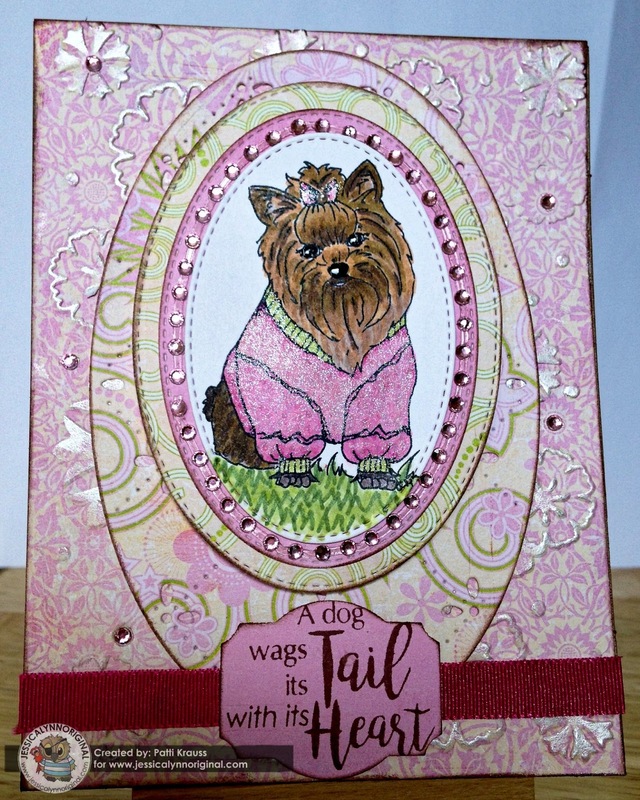 Add pink adhesive gems to frame the focal image, and scatter a few on the card base. Add a pearl gem to the center of the Yorkie's bow. Stamp the "Dog Wags" sentiment onto coordinating paper and cut with label punch. (I had to mask the "A dog" portion and stamp in separately to fit it into my chosen label.) To finish, add ribbon to bottom of card, then glue label in the center.